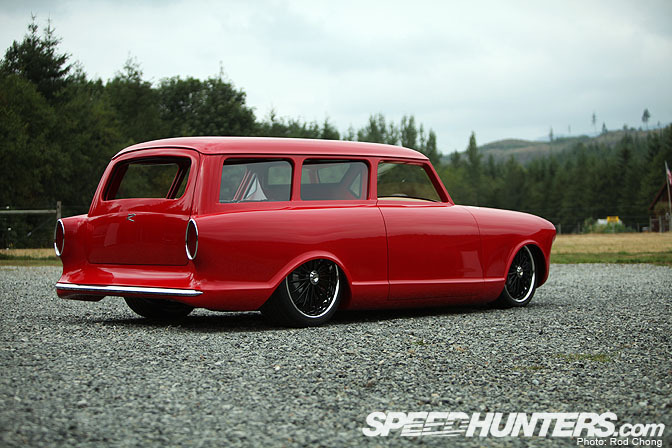 Let’s imagine we’ve just set eyes on this little red wagon/estate for the first time. At a quick glance, it looks like some kind of vintage Ferrari machine. Perhaps the wheels are too large and the stance too low for it to be 100% original, but it does have a pure classic style going. Did Ferrari make a 250 GT Lusso station wagon/estate in the early 1960s? This little red wagon certainly gives that impression. 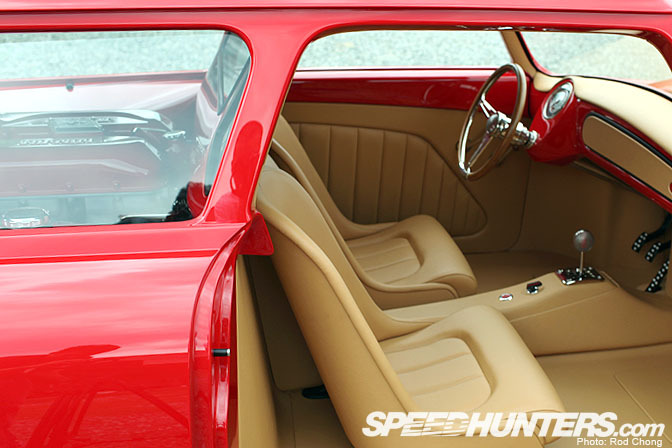 Looking inside the car, we see it carries an Italian theme across. But why the separator behind the front seats? 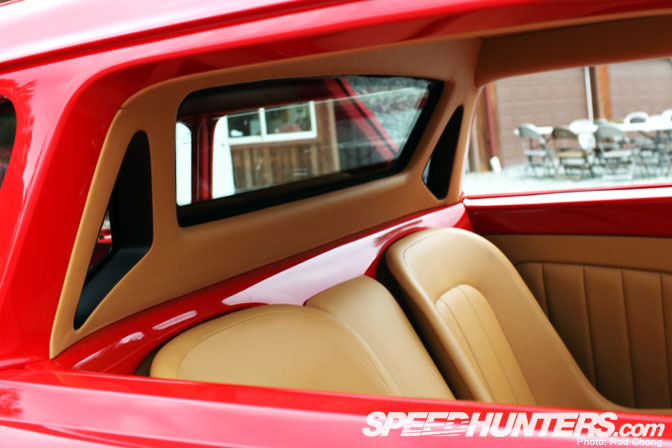 A look into the rear of the car reveals a surprise. 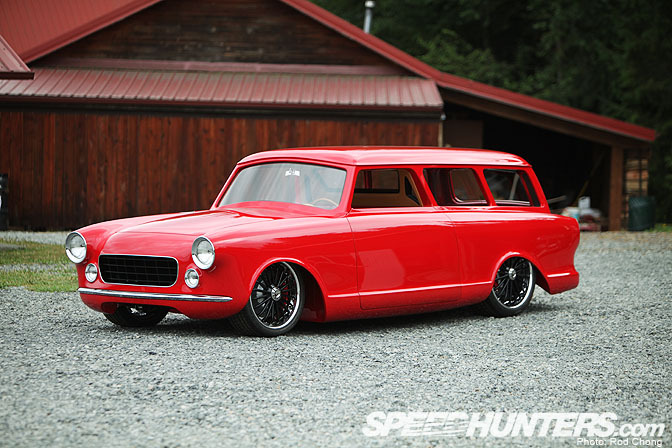 As far as I know, Ferrari never built a mid engined wagon/estate. But this is precisely what this unique machine is. 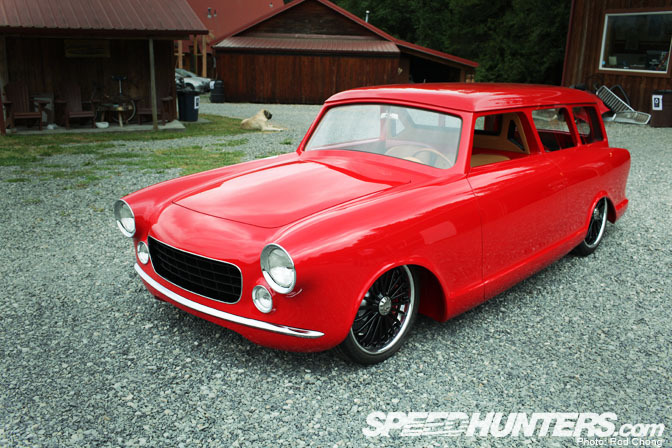 May I introduce Ferrambo: a 1960 Rambler Station Wagon merged with the DNA of a late model Ferrari 360 Modena. 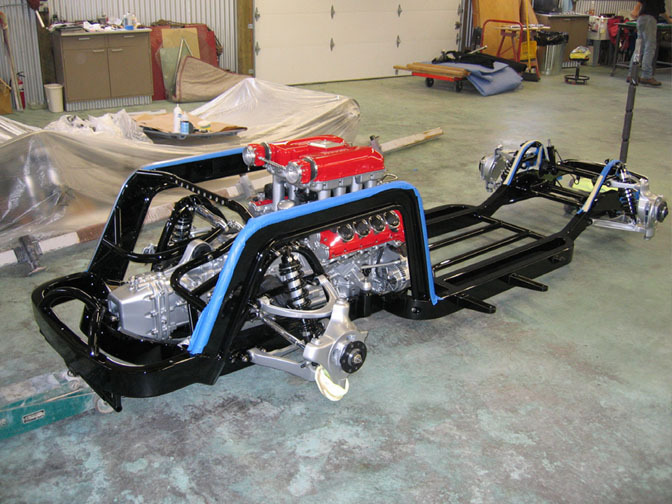 The winner of the much coveted 2008 Ridler Award, this is a big budget show car build. 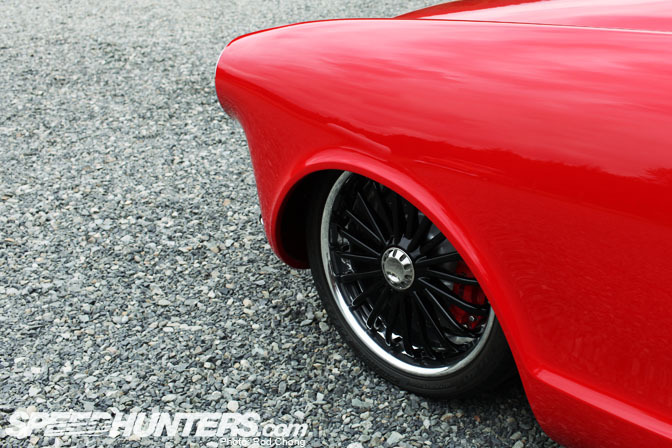 However, this Rambler is unlike any show machine ever previously constructed. It’s not dripping with chrome and over-the-top styling. But instead combines a mix of modern and classic Italian style with a very unlikely chassis. Take a look at the mid-engined installation. 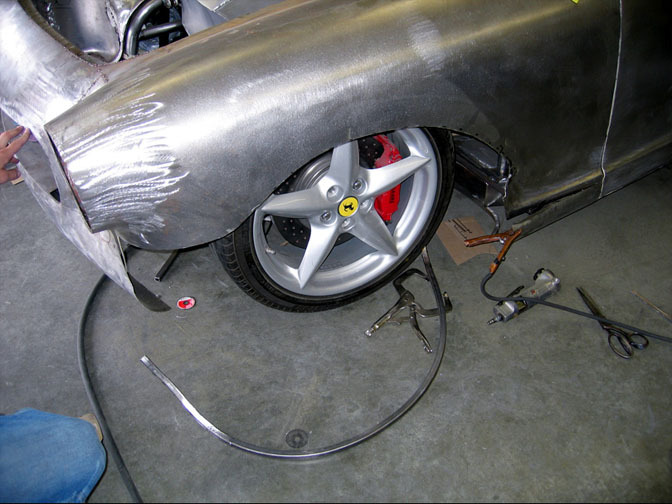 The car’s suspension, engine and transaxle were pulled from a wrecked Ferrari: the product of a prom night gone wrong. 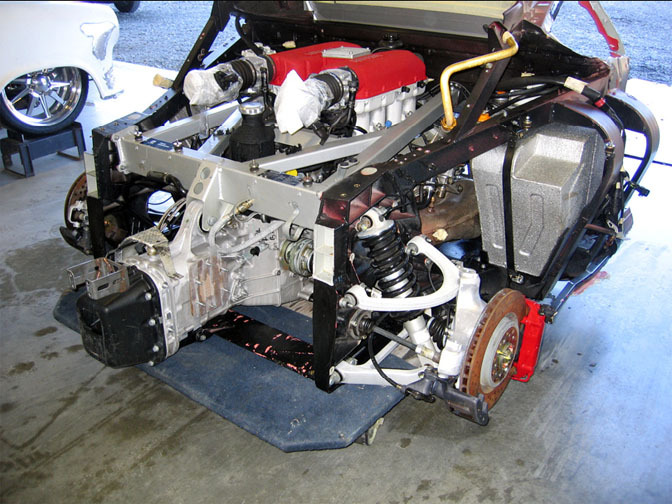 The engine/transaxle and suspension were transferred over to a custom chassis. 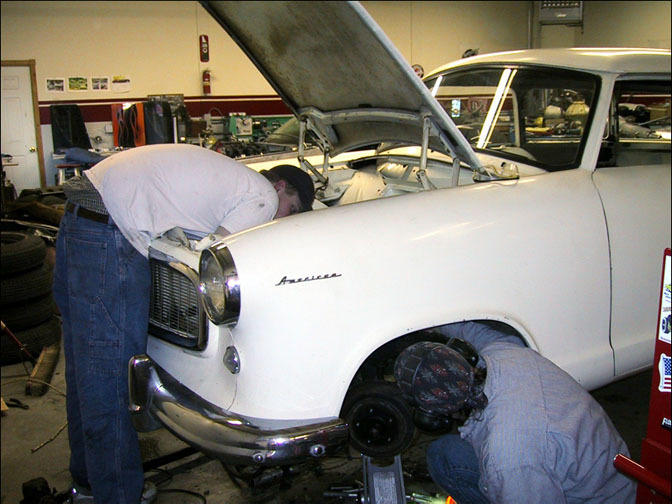 The longer you look at the Rambler wagon, the more details you see. Check the Ferrambo logo. 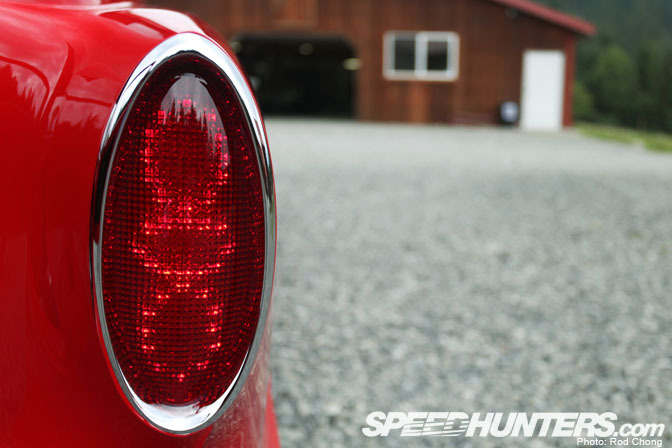 I also like the hand set LED tail lights. 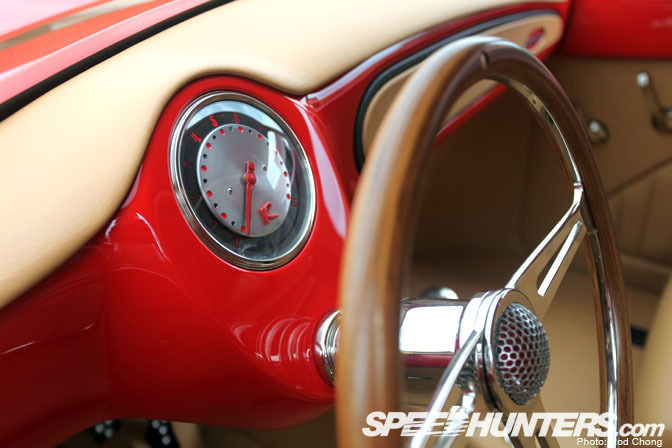 When I first laid eyes on the smoothed out retro dashboard I thought it was hand formed for the car. But in reality, it’s only mildly updated from the original item. More detail work: you’ll notice the intakes for the engine are built into the rear pillars. They then feed air to the engine through these long red tubes. 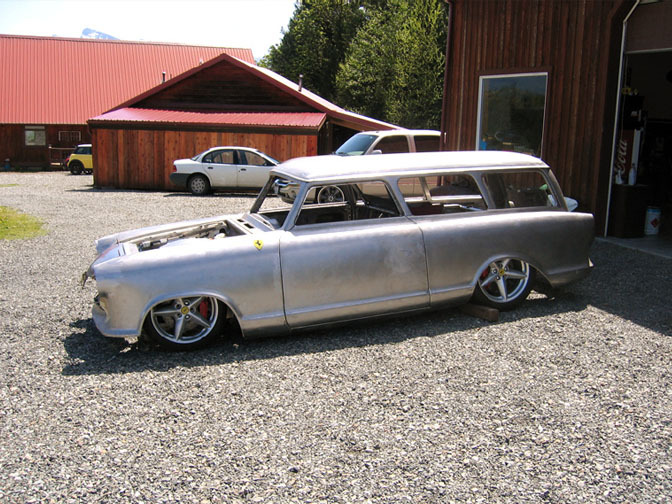 I should mention Ferrambo was built by Divers Street Rods of Startup, Washington State. We were invited to visit them by John Naderi of Streetfire.net last August while attending the Seattle round of Formula D.
It’s at Divers that we got to check out their famous 2008 Ridler Award trophy. 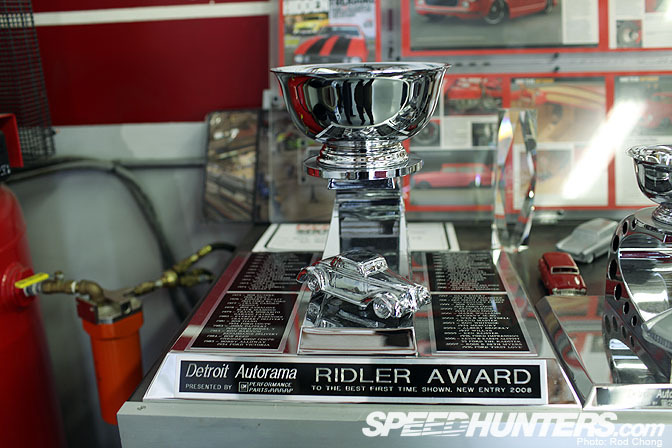 For those of you who don’t know, the Ridler Award is the highest award for a Hot Rod or Custom in the American show car scene. It’s been going non-stop since the 1960s and is notoriously difficult to win. Any serious contender for the award must be built with meticulous attention to detail and be utterly perfect in every way possible. 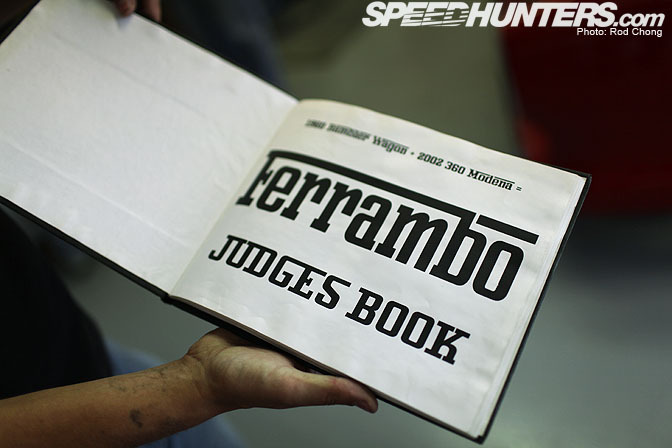 The Divers’ crew showed us the Judges Book for Ferrambo which documents all aspects of the car’s build. If you are interested in you can download it here. 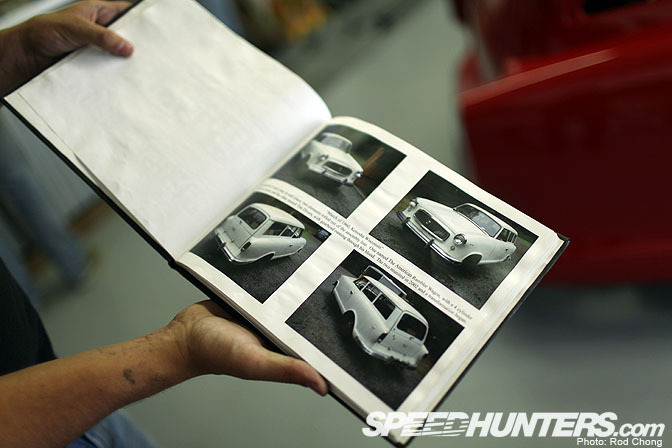 The book starts with photos of the original 1960 Rambler wagon. It’s not a million miles away in form from the final show car. 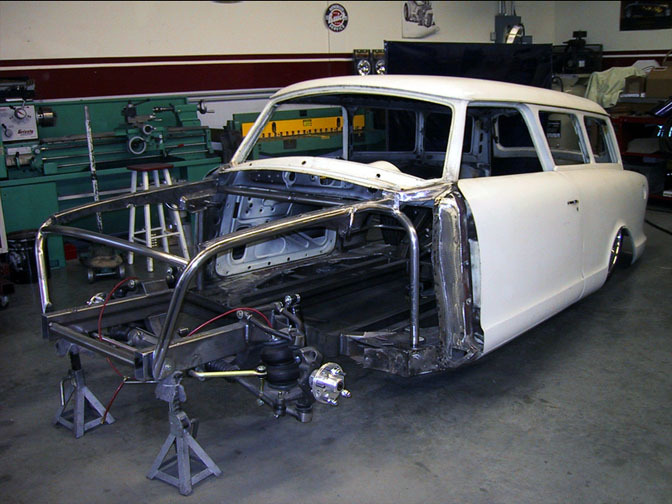 The Rambler wagon was originally a unibody style chassis, so the first step was to cut away the floor to allow for the installation of a bespoke chassis. Original plans were for the car to have a front mounted V8 engine mated to an Art Morrison chassis complete with Air Ride. 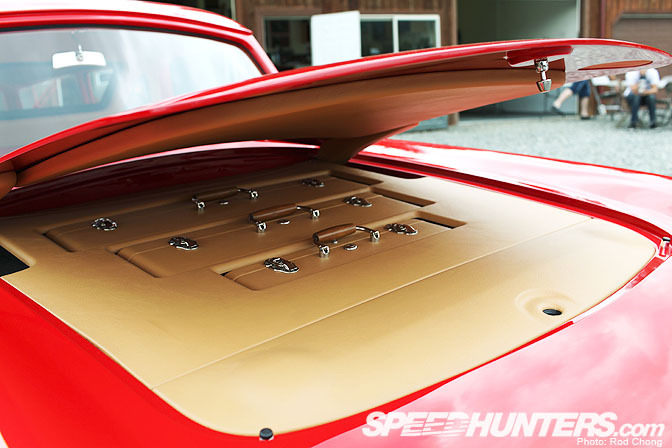 That plan soon changed though as as builder Tim Diver and Mike Warn hatched the insane plan to install the complete running gear from a Ferrari into the middle of the car. 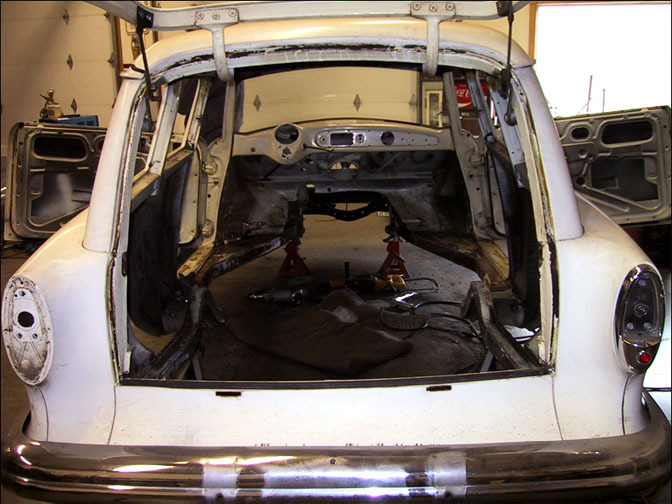 The floor was cut away to allow for the mid engine conversion. 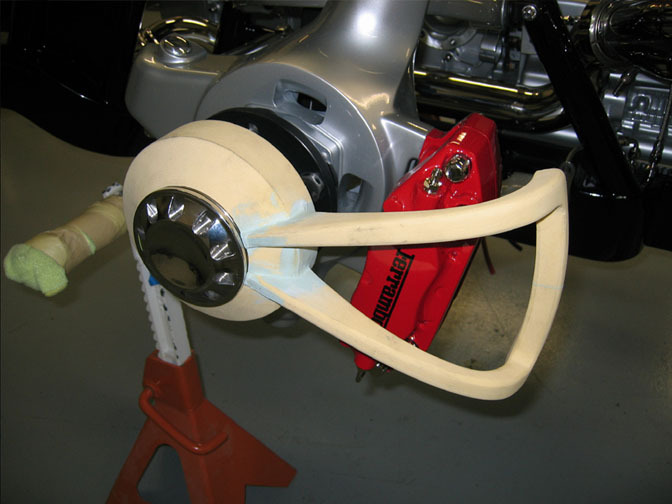 Here you can see how a tubular structure was created after the original unibody was removed. The front portion of the original Art Morrison chassis was also retained. 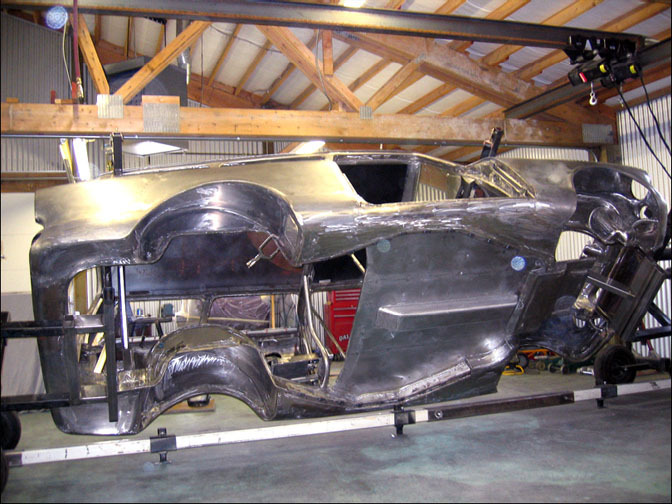 The rear portion of the Ferrari 360 just as it was separated from the wrecked chassis. 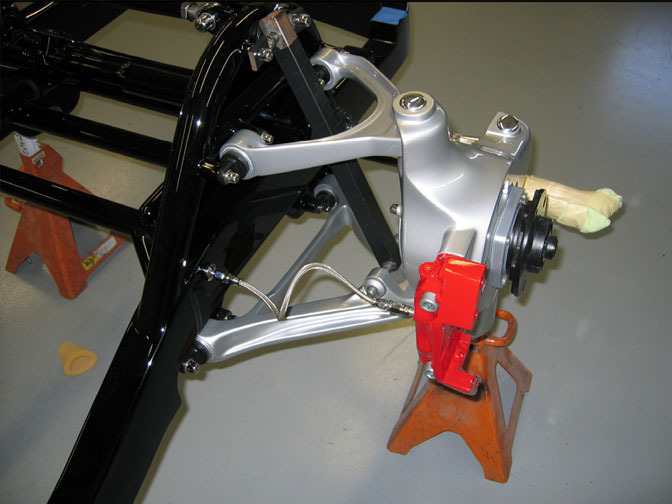 This assembly was carefully studied so it could be re-engineered to fit inside the Rambler body. A rotisserie was set up to ensure that the underside of the car received just as much attention as the top. The Ferrari-ization of the Ramber is taking form here. The headlight area has already been extended and a new grill area is being mocked up. You can see at this stage, much of the front of the car including the wheel wells are still stock. Note the production Ferrari wheels. Now the front of the car starts to take its final form. 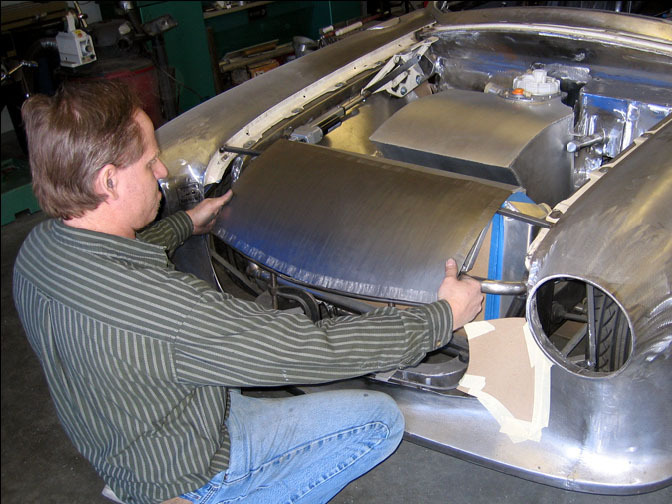 The wheel wells are reshaped to allow for more turning radius, and the bumper area is being redone from scratch. In the end, most of the front of the car was completely restyled. This is an interesting photo. 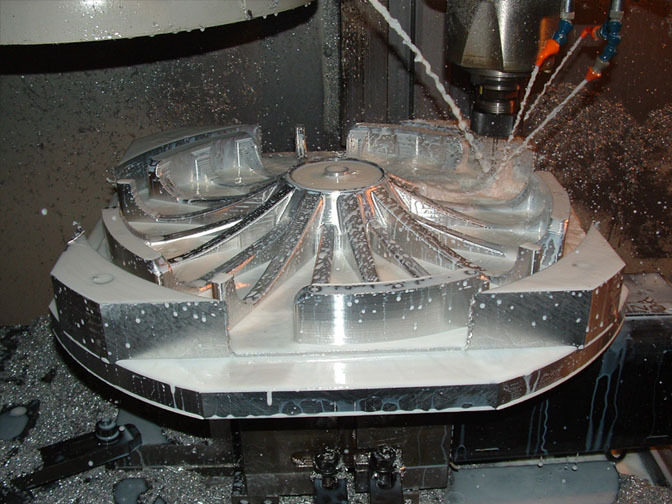 A section of the custom wheel was created in foam to allow the team to check clearance. It was only after this stage that the full wheels were milled into life. 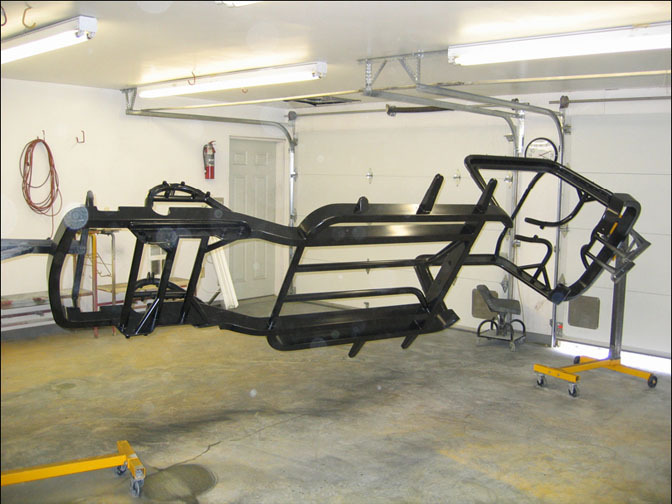 Here’s a look at the custom chassis. The front portion was created by Art Morrison, while the rear part was done at Divers. The engine and rear suspension sub-assembly bolts right in. 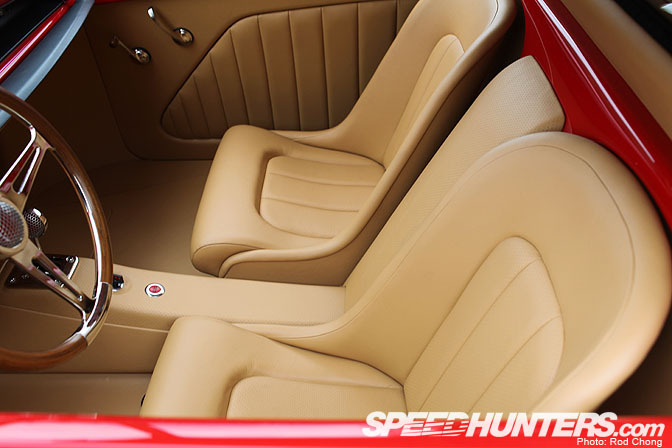 These are production Ferrari 360 Modena items, but they’ve been reworked and resurfaced to perfection. The same goes for the underside of the car. 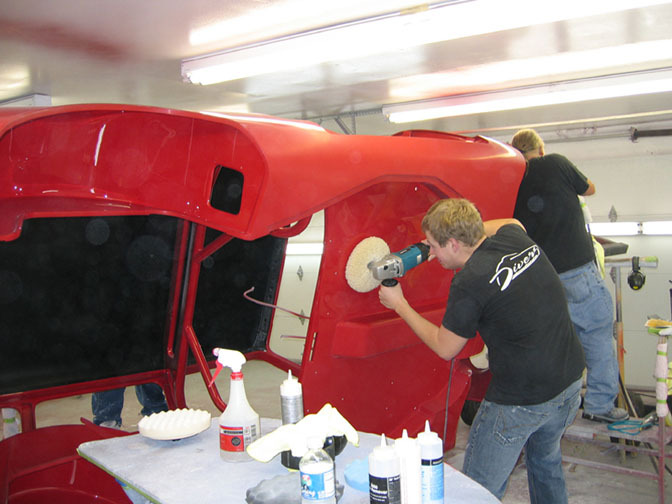 Every element of the car is sanded, smoothed, polished and buffed. This results in a machine which perhaps shouldn’t even really be called a “car” any more. It’s more like a rolling sculpture which is the absolute pinnacle of hand-built cars. It’s likely this car will never be driven on a road. But criticizing this machine for not being street worthy is missing the point of what these high end show cars are all about. It’s better to look at this car as a dream machine: it’s meant to inspire and excite as an exercise of pure fancy. 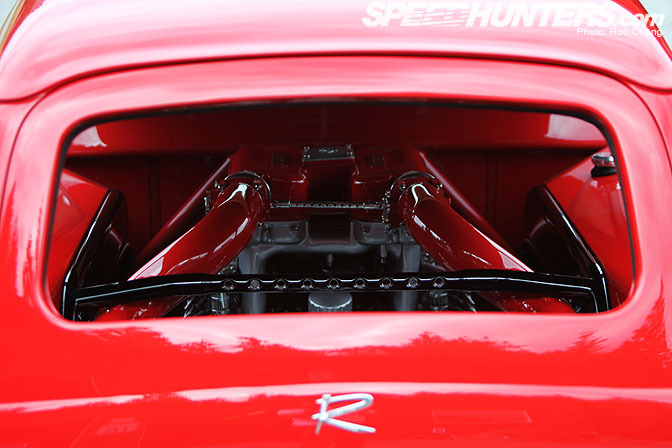 For me, I just love the fact that someone was crazy enough to go through with building such an insane car to the highest level of detail and perfection. Absolutely stunning car, and I love the floor less concept for the engine bay. I like everything accept the wheels. Scratch that... I LOVE everything accept the wheels.. Put some black 5 spokes on it, and it was look sick.. 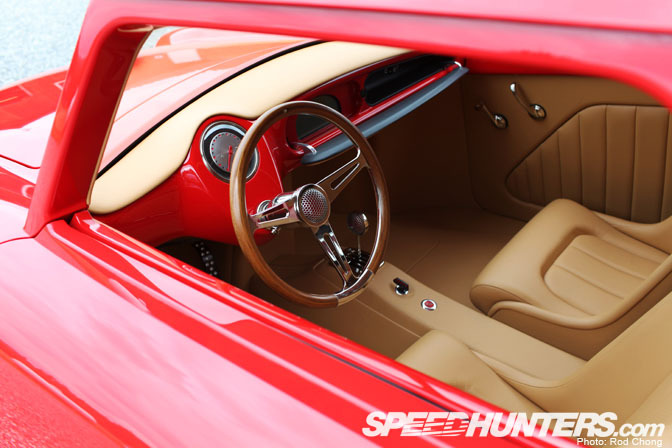 While people may not agree with the design or the style, the respect and homage payed to the original 360 remains to be remembered, along with the attention to detail under and over. I don't care if this car is ever driven. It is meant to inspire. 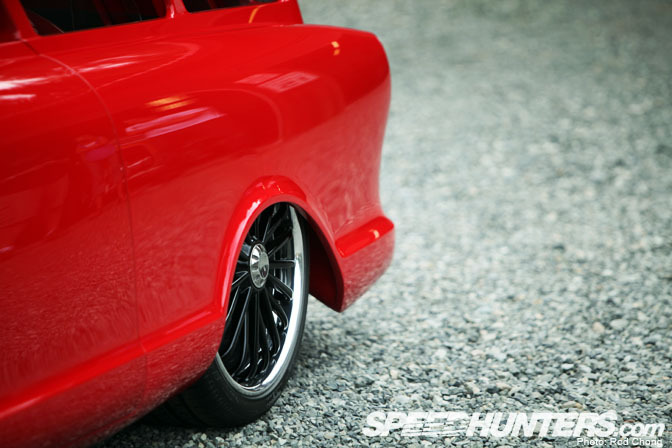 That is the best car SpeedHunters have had on the web site. Errr.... no. Awesome fabrication work, ugly design, IMO. 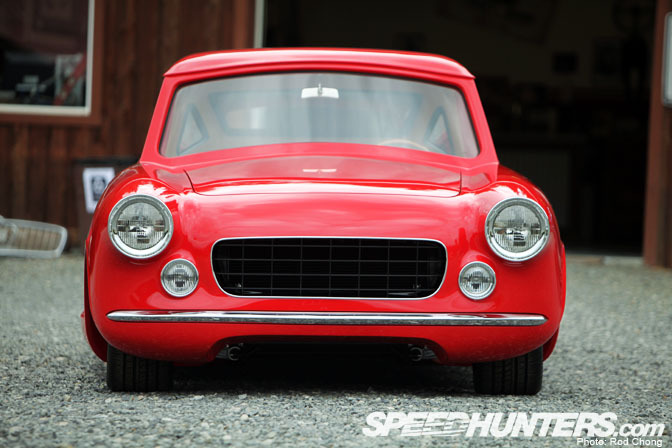 "As far as I know, Ferrari never built a mid engined wagon/estate." And nor would they this ugly. Excellent post! This is truly a work of art. When do we get to see the pictures of the hotrod in the reflection in the 22nd picture? Reminds me of McDonalds. IM LOVIN IT! this is the most badass build i've ever seen in my lifE!!!!!!!!!! This is awesome, though I must say, Ferrari has indeed built an estate/wagon before (not sure if it is MR though). The Sultan of Brunei who was a massive car nut, had it specially made for him by the chaps in Modena. Also had one of the 767 Mazda LM cars and a few other rarities. 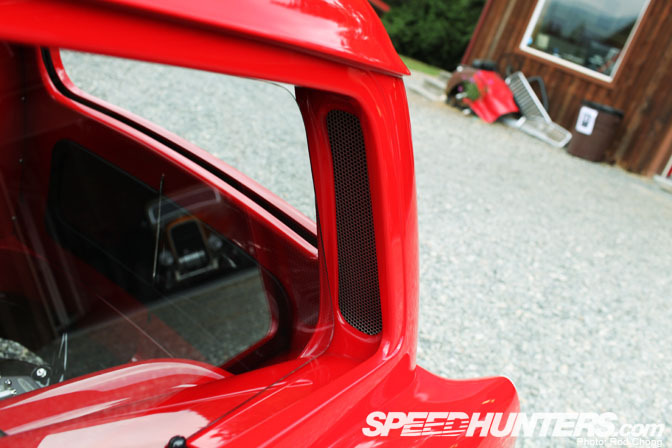 Still doesn't take away from the fact that this is proper craftsmanship. 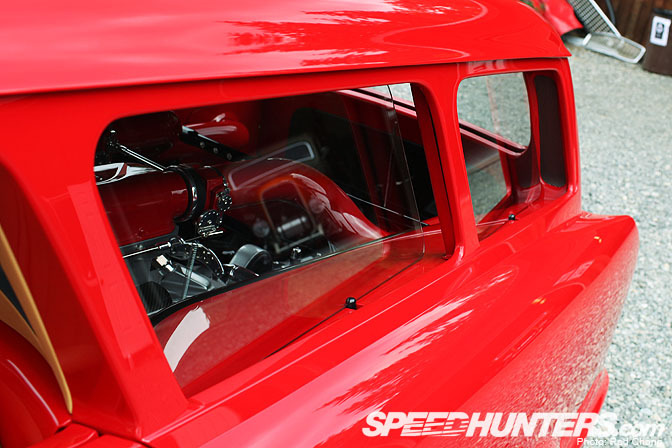 Look into the 32 ford with the Ferrari motor. 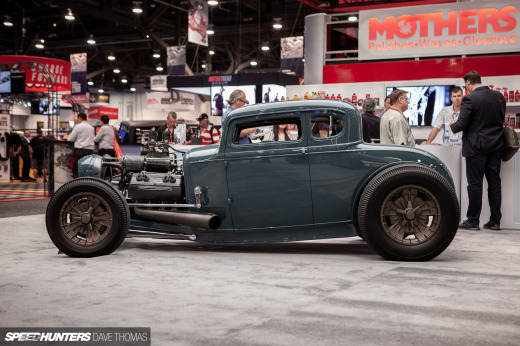 It was on display at the Grand National Roadster show for the 75th Anniversary of the 32 Ford. What's the reason that it's not driven? Really like this project, doesn't come a lot more unique then this! A monster. Never saw something similar before, and i ADORE it. Some Wallpapers please, I beg for them. 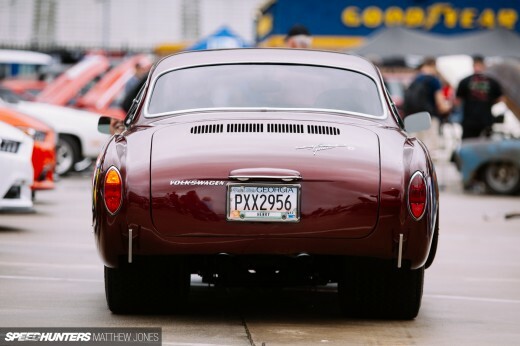 "It's more like a rolling sculpture which is the absolute pinnacle of hand-built cars." Absolutley stunning, only fault is the wheels, other then that it would be automotive perfection! EPIC! If only they left those Ferrari wheels! But still, it's great! Man this thing is disgusting. Why would anyone waste there money on such a pointless project?! I can't believe anyone would like this heap of junk. I'll stick with my honda prelude thanks. Horses shouldnt be tied down, great concept though. Such a waste of money and time! 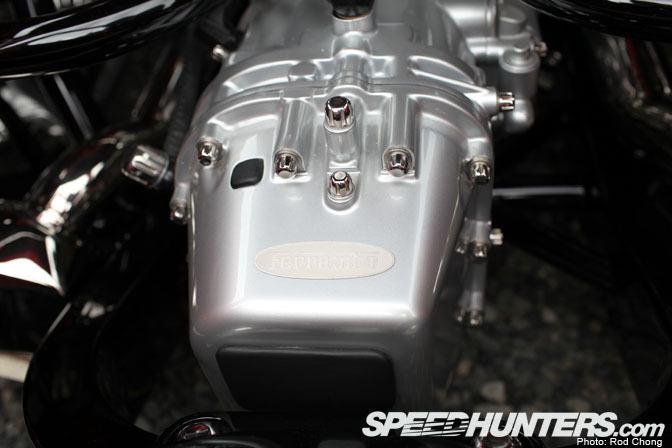 Awesome craftsmanship - I bet that sounds insane at full throttle. 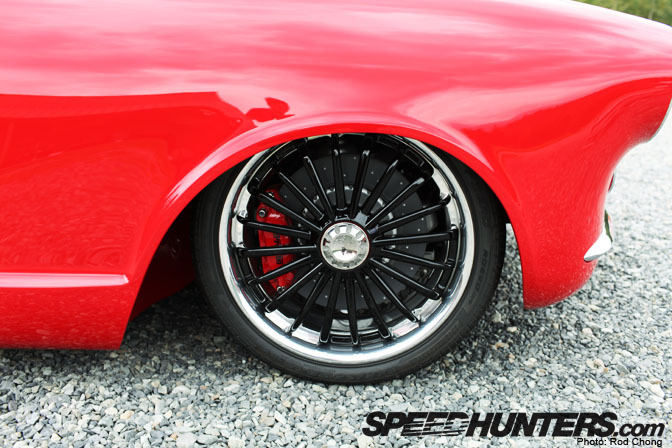 More features like this, SPEEDHUNTERS!!!!!! 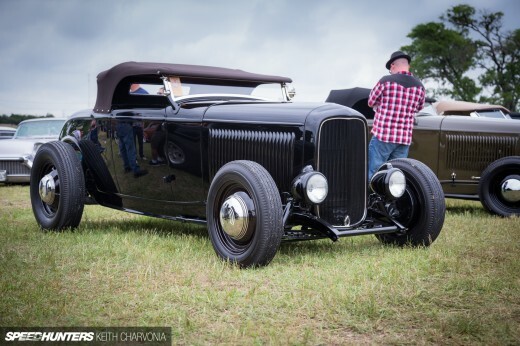 You missed the hotrod in pic 10! Wow, that is some work! i saw this car at the goodguys show last year in washington, it was sick and sounded badass. The attention to detail is staggering on this build, great work! Also, as Sciclone said, Ferrari made an estate which was based off the 456. So front mounted V12 rather than mid-mounted V8. Personally I'd rather have a whole F360 than the Ferrambo, but I still respect the builders for this spectacular creation. Beautiful. Could you post it in the desktop category to? Love the exquisite details of the car, especially the fitting luggage. I don't think criticizing this car for not being street driven is missing the point at all. I think it's completely valid. What a shame that this car doesn't see use. Why create something incredible if you're not gonna use it? Cars are meant to be driven. It's as simple as that. I bet it's awesome to drive onto and off of the trailer. It's kind of sad when you think about it. what ChippeRX7 said - more features like THIS please! You think that looks fast and mistfit? Check out the CITRORRARI on youtube. A fussion of a Citröen 2CV and a Ferrari F355. This car is so well done that I think you will be able to show this car at a custom cars show or even a conqor 20 years from now and bet it still will get an award of some kind.